It was nightfall when the blood came. William had been set to sitting and watching, so the surgeon could attend to others. He had never seen so much before. The fall had cracked the old man’s ribs, a crunch and a cry as he hit the rail before tumbling over into the water, but he had swum to the rope that had been cast for him, and hauled himself back up onto the deck. Only later, after the sun had fallen and a spray of stars had replaced its light, had he shown any sign of illness. The weakness came, and under the break was the blood. The surgeon had shaken his head and lashed him into his hammock, and told William not to take his eyes off him as his chest rose and fell with the rocking of the waves. Dutifully, he had watched as the man slipped into fever, knowing that for him to see the next day’s dawn would require the wings of a miracle. He had seen death. He just hadn’t seen so much blood. The surgeon nodded and didn’t look too surprised. On one hand, it didn’t matter that much. The man would be sewn up inside the bed where he died, a pair of cannon shot at his feet and a prayer read as quickly as was decent, so the rest of the crew could return to what was important after sliding the body into the waiting embrace of the gleeful ocean, coldly cruel, ravenous and riled. If he had a wife, she would go on living for months until the ship returned to port, bearing bad news and little memory of one more hand sacrificed to the deep. It didn’t matter that much, William thought, threading the needle. No one who went to sea could reasonably do so with the hope of return. 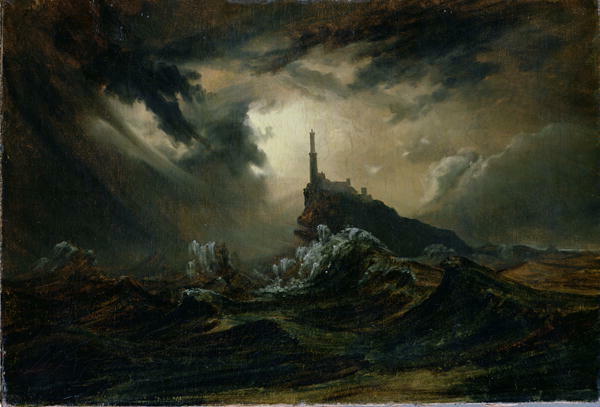 There were storms and sharks and savage men, and sickness lurking in the lonely isles. There was his Nancy, waiting for him on a long-forgotten shore. His pretty Nancy, who wrote him letters that she could never send, sitting by the window, helpless, never trusting the strength of her prayers to bring him back to her as the mistral winds shook the rattled glass in the attic. It was the only place she could see when the tip of a mast ghosted into harbor. She would run down the stairs and skip to the wharf, hoping against all her hope that it was the one she wanted. He had seen death before he finished stitching closed the canvas over the pale and passive face of the empty man’s corpse. But there had been no blood with Nancy. There had only been her joy, transforming, transfiguring in the moment before her slipper tripped her on the top of the stairs. He had come for her by land, a lover’s trick that had indeed surprised her as she tumbled, tumbled down to him, a cry cut short as he pressed her lips to his, hoping against all his hope that there remained a ghost in her. There was no blood with Nancy. There was a stone with a view of the harbor, and isles best left alone. She would wait for him, and he would trust the strength of the sea to reunite them, a prayer and two shot at his feet, tumbling, tumbling down at her mercy, helpless, trusting to the mistral winds for one last lover’s trick, transforming, transfigured into reunited joy.